Sulaymaniyah's Market Square. Image courtesy of the author.Tossing about on a broken bed in a cheap hostel in the centre of Sulaymaniyah, I was struggling to fall asleep. The sun hadn’t come up yet, but I could already hear the muezzin’s call to prayer drift through the window. My interest in socio-economic alternatives to capitalism had led me off the beaten track: this was my first night in Iraqi Kurdistan. Kurdistan is the unofficial name of territories where Kurds form a majority of the population. These include large parts of modern-day Turkey, Iraq, Iran, and Syria. The Kurdish people are a fairly diverse ethnocultural group; the spoken dialects of the Kurdish language can be quite distinct from each other. The development of national self-identities, which accelerated among many Asian peoples in the twentieth century, has given many people of starkly different social and cultural backgrounds who live in different parts of Kurdistan a sense of belonging to the same nation. This became an important factor in regional politics. Often, it has led to armed and occasionally deadly conflict. The pursuit of national self-determination by Kurdish organisations has shaped the fate of four separate states to a significant degree. The autonomous Kurdistan region in Northern Iraq was established by Kurdish independence advocates in 1991. It forms a part of Iraq, but is de facto independent of Baghdad. The capital of autonomous Kurdistan is Erbil, and Sulaymaniyah is second in terms of both size and importance. Sulaymaniyah was where the Kurdish dialect group known as Sorani developed into a literary language, home to many Kurdish poets. Today, it has four universities (two private, two state) and houses three museums. Sulaymaniyah is seen as the cultural capital of autonomous Kurdistan, with a way of life more liberal than elsewhere in the region. As the overnight plane from Istanbul to Sulaymaniyah took off, I panicked a little. This was my first time travelling to a country of indeterminate political status – and what’s more, it was going through a full-scale war. In practice, the arrival to Kurdistan was an entirely mundane affair. The Sulaymaniyah international airport has something in common with a bus station in a town not far from Moscow. It’s a small building, with screens dividing it into several rooms. On the wall, a discreet portrait of the local political leader, the chairman of the Patriotic Union party and former president of Iraq Jalal Talabani. The visa desk, border agents, and baggage claim could all be found a few feet from each other. A few people at the airport even spoke English, more or less. Soon, my passport was sporting a Republic of Iraq stamp – foreigners can stay in Iraqi Kurdistan for 30 days before they need to extend their visa. Under Saddam Hussein's rule, this building housed the local secret police. Now it's home to the national museum. Image courtesy of the author.The plan was to leave Sulaymaniyah quickly and travel to Syrian Kurdistan, our final destination. When the Syrian Civil War broke out in 2011, the Kurdish Democratic Union Party (PYD) took over from Bashar al-Assad’s officials with little bloodshed. In accordance with their political programme, the activists set up local councils and self-government committees; land previously owned by the state was given over to agricultural and manufacturing cooperatives. In addition, the existing paramilitary party units served as the basis of a more regular armed force. The People’s Protection Units (YPG) were formed of volunteers and acted as a militia. The nascent autonomous region was christened Rojava, or “the west” in Kurdish – the Syrian lands are in the western part of Kurdistan. In 2012, Rojava proclaimed itself a “democratic autonomy”. Since then, Syrian Kurdistan has seen an influx of people from Western countries who believe in a new kind of society and want to help build it. Very soon after its formation, the autonomous region came under sustained assault from a variety of Jihadist groups. Soon, Rojava became a magnet for people wishing to take up arms against the mightiest Jihadist group of our day: ISIS. On our first morning in Sulaymaniyah, we started looking for ways into Syrian Kurdistan, sending email after email and making phone call after phone call to every local contact we had, thanks to our friends from Europe. Getting to the coveted land is not easy: on every side, Rojava is surrounded by political opponents or military adversaries. The southern frontier is the frontline of the war against ISIS and other Salafist groups. To the north and west is Turkey: its government has long been in conflict with the Kurds and closed the border with Rojava as soon as it proclaimed its interest in political autonomy. Crossing the border of Rojava either with Turkey or with the Iraqi Kurds’ autonomous region can be a struggle even for humanitarian convoys of international NGOs. We found ourselves to Rojava’s east, across the Tiger River, in Başûrê (or, in Kurdish, “the south”) — the southern, Iraqi part of Kurdistan. 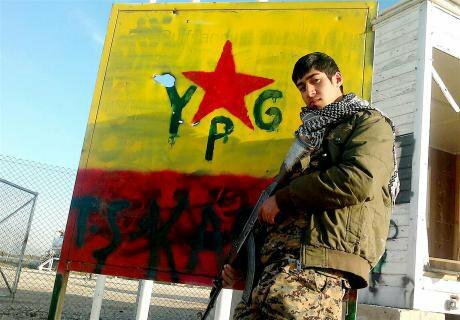 A YPG fighter in Rojava. CC-BY-2.0 Kurdishstruggle / Flickr. Some rights reserved.Rojava’s leading political force, the Democratic Union Party (PYD), has proclaimed its intention to create a society based on direct democracy, “communal economy”, and ecological sustainability. Within its first year, the autonomy established a system of local authorities, based on street and village assemblies that elect delegates to higher-level councils. Particular attention is paid to the need for gender equality – an especially relevant and explosive issue in the Middle East. Similarly, ethnic equality is considered important: Rojava is home not just to Kurds, but also Arabs, Assyrians, and smaller ethnic groups. Critics accuse the Democratic Union Party of creating a one-party regime in Rojava under the pretence of self-government. However, western activists and scholars (such as David Graeber, Janet Biehl, and others who have visited the region) are saying that the radical democratisation of society in the autonomy is real. According to Revolution in Rojava. Democratic Autonomy and Women’s Liberation in Syrian Kurdistan, a book written by three activists who visited Northern Syria in 2014, the self-governing structures of Rojava consist of several levels. The foundation of self-government is the “commune”, an assembly of residents of a street or a village. The communes send delegates to local councils, responsible for town districts or whole villages. One level up is the canton council, which covers entire towns and their environs. Finally, at the top of this system of self-government is the People’s Council of West Kurdistan, which includes every delegate of Rojava’s canton councils as well as representatives from the civil society and political organizations. Each assembly has two co-chairs: a man and a woman. As a rule, they are the ones who serve as delegates to higher-level councils. Together, the co-chairs of canton councils are part of TEV-DEM – the Movement for a Democratic Society (Tevgera Civaka Demokratik). Each council also has separate committees that deal with specific issues: economic, political, judiciary, female and so on. The complexities of Kurdish politics can be confusing. Most political forces describe themselves as adherents of “democratic” and “patriotic” ideologies. In reality, however, they hold very different principles and are in a constant state of struggle with each other. The Syrian Democratic Union Party and the Iraqi Kurdistan Democratic Party (PDK), led by the president of Iraqi Kurdistan Masoud Barzani, are not on friendly terms. PDK has its own designs on oil-rich Rojava. Through the party’s affiliates, it aims for regional hegemony. The Kurdistan Democratic Party and the Patriotic Union of Kurdistan (PUK) are the main political forces in the Iraqi Kurd autonomy. They have a long history of confrontation and even armed conflict. In 1998, the two adversaries made peace and came to a power-sharing agreement. Even so, the region is still divided into two parts. The north, which includes Erbil, is controlled by PDK; the south, and its main city of Sulaymaniyah, is ruled by the PUK. Both parties have their own armed militias, the peshmerga. As a result, the PDK government (citing variously the danger of jihadist attacks or Rojava’s “undemocratic” behaviour) periodically closes crossings into Syrian Kurdistan, including the main one: Semalka, on the River Tiger. Getting around Sulaymaniyah is even more difficult than navigating the complexities of Kurdish party politics. Although the most widely spoken and best known dialect of Kurdish, Kurmanji, uses the Latin script, the population of Sulaymaniyah speaks and writes in Sorani, which has an alphabet based on Arabic letters. Not all signposts and street signs have Latin equivalents. Asking for directions can be difficult, too. Few people here know any English words whatsoever. On a couple of occasions, we were given directions in English, sometimes our rudimentary Kurdish was enough, but most of the time passers-by just shrugged their shoulders. All the same, locals can have a picturesque appearance. Many men over thirty wear traditional Kurdish clothes: wide, baggy trousers, a sash around the waist, and star xani – a buttoned jacket tucked into the trousers. Younger people often prefer western clothes. Many women wear long skirts, although trousers are common, too. However, you would never see a skirt shorter than the knee. Many wear headscarves, but the hijab is less frequently seen than one might expect. The stricter forms of Islamic female dress, like the niqab, are something of a rarity. Generally speaking, the progressive nature of life of Sulaymaniyah is evident even in the dress of its inhabitants. 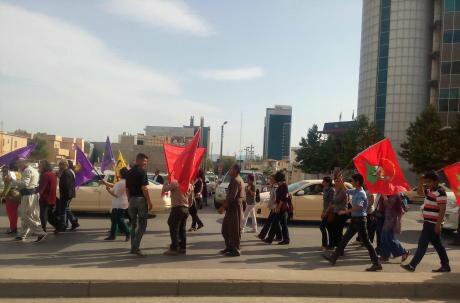 A May Day celebration in Sulaymaniyah, with European and US leftwing activists taking part. Image courtesy of the author. Sulaymaniyah is where most people wishing to get into Rojava come to. Here, you can safely wait for your opportunity to travel into Syria. If it presents itself, you can take a bus or drive a car through PDK-controlled territory and cross the border. However, ever since Rojava proclaimed itself the Federation of Northern Syria in March 2016, the relationship between the two neighbours has been strained and the border remained closed at the time of our arrival. In the end, every question we had about crossing the border into Rojava invariably received the same answer: “The situation is too difficult, border crossings are blocked by the PDK – there is nothing we can do to help”. Since becoming an autonomy, Rojava, a small region with a population of three and a half million people, has been a magnet for numerous civil society volunteers, anarchists, and left-wingers. So we were not the only people stuck in Sulaymaniyah — there were dozens of young Europeans and Americans looking for ways into Syrian Kurdistan. For them, Sulaymaniyah became more than just a transit point — it was their home while they waited and searched for paths across the border. Many had been stuck here for several months. Our group of patient pilgrims had some truly extraordinary members. Marvin (his and others’ names have been changed) was an engineer and anarchist from the USA, looking every bit the A-student: thin, bespectacled, and somewhat dishevelled. Not that long ago, he had graduated with a master’s degree. “In the US, when you study engineering, you hear all about how great your prospects are. In reality, finding a truly interesting job is hard. I feel like in Rojava I could do something that would really benefit people,” he said. Marvin wanted to live in Kurdistan for, at a minimum, two years. His plan was to help Rojava’s self-government to assemble complicated machinery. He had spent more than a month in Sulaymaniyah — at first, at the same hostel that we lived in, later moving to a cheaper one, a kind of dormitory for migrant workers. When he began to run out of money, Arif, a local left-wing activist, took him in. The US consulate had refused Marvin assistance with extending his permission to stay. In a few days, he would have to pay a fine of two hundred dollars and take a bus to Silopi, a Turkish town on the borders of Iraq, Turkey, and Syria. Here, he would take the same bus back and get another thirty-day visa. Others told similar stories. All of them had been in Sulaymaniyah for a long time, a depressing state of affairs. Bob, a large, portly old man with sideburns, was another American, an agricultural scientist by background, 45 or 50 years old. He wore a Kurdish red-yellow-green scarf and pins with emblems of YPG and the Kurdistan Workers’ Party. In a deep voice, he told us that he was heading to Rojava to set up agriculture organized on Kropotkin’s principles, the chief of which are cooperation and communal ownership of land. A few other young men, twenty-five or so years old, wanted to join the YPG: Klaus, a militant antifascist from Germany; Pierre, a black Frenchman of African extraction and former member of the Légion Étrangère. Pierre often mused about improving Rojava’s financial situation by ramping up the export of oil. A week after our arrival to Sulaymaniyah, we had abandoned all hope of getting into Rojava: no-one had offered to organise our transit there. Fortunately, we did not have to come back to Russia with nothing to show for our troubles. A few Kurdish friends arranged for us to go to a refugee camp in Makhmur, 60 kilometres from Erbil and twenty from the frontline with ISIS. The only thing I knew about Makhmur at that stage was that it was one of the places where the Workers’ Party (PKK) were active in Iraqi Kurdistan. There are, essentially, two Makhmurs. One is a fairly ordinary town with a mixed Arab-Kurd population. After the overthrow of Saddam Hussein, it came under the control of Kurdistan’s regional government. The other Makhmur, about half a kilometre away from the main town, is a camp for refugees from the Turkish parts of Kurdistan who left their homes in the mid-1990s, at the height of the armed conflict between Turkish government and the PKK. In 1998, they settled here, where, as every local told us, “there had only been desert, teeming with snakes and scorpions”. Over the past eighteen years, the camp became an autonomous settlement with its own complex social structure. The deadly desert was turned into an oasis with gardens, flowerbeds, parks, and gardens. Twelve thousand people live here. In 2014, Makhmur was captured by the advancing Islamic State. However, the civilian population was able to evacuate and the self-defence units retreated to the Karachokh mountain behind the camp. Just then, the Workers’ Party militia swiftly counter-attacked from the Qandil Mountains and recaptured the camp after two days of fighting. Since then, the settlement has been under PKK’s control. At least a thousand armed members of the party are stationed near Makhmur and they (rather than government forces) are the inhabitants’ shield against “jihadist” attacks. A cooperative cafe in Makhmur. Image courtesy of the author. Makhmur defences are threefold. The first line is the PKK cadres deployed near the camp, who man the frontlines against IS. The second is the Asayish, a security force that controls checkpoints and guard towers as well as a moat dug around the camp to fend off potential attacks. The third group is the entire adult population of Makhmur, regardless of gender. Any adult living in the camp may receive military training, after which they are sent on armed patrols outside the camp’s perimeter every twenty days. 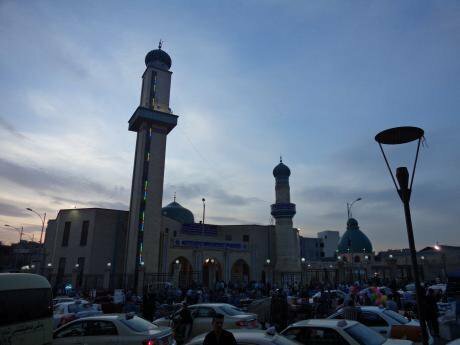 Nonetheless, although the situation in the region remains tense, we only saw armed people on the streets of Makhmur twice over the two and a half weeks that we spent there. These were members of the Asayish (meaning “security” in Kurdish), a voluntary militia whose task is to intervene in cases of major disturbances and protect Makhmur from outside attacks. “We make decisions on everything together, at weekly meetings within squads and monthly general assemblies. If a senior officer makes mistakes, they are recalled”, says Sadiq, a member of the Assayish with grey hair and a large family, who seems to have some experience with military conflicts in Turkish Kurdistan. The Makhmur camp is an oasis in another sense, too. The PKK, which has been the major political force in the settlement from the very beginning, has organized self-government on a wide scale, a system of mutual aid, and several cooperatives. The scope of these systems is astonishing to someone used to life in a Russian metropolis. The camp is divided into five areas or sectors. Each has its own council, or mejlis. The sector’s mejlis is responsible for solving all internal issues, from social welfare to family conflicts. Each has several committees: on welfare, education, ecology, conflict resolution, and so on. Any problems that go beyond the scope of the sector or cannot be solved by the local assembly on its own are escalated to the settlement’s general mejlis, which is composed of delegates from sectoral councils and committees. It also has a number of directly elected members. When we arrived at a local council — an unassuming concrete building in the midst of a pleasant small garden — we saw a group of middle-aged men, sitting on chairs scattered outside. In front of the closed door there were many pairs of women’s shoes. “The female part of the council is holding its own separate session,” the men told us. Over the next several days, we had many meetings with members of the general mejlis and various committees in Makhmur. There are many of those, about 30. They serve as the executive branch and regulate almost all spheres of public life, each with own area of responsibility: from car owners’ issues to workers’ rights, education, healthcare, and justice. The judiciary committee has 11 members, elected by Makhmur residents. “We are not some kind of state-sanctioned court. In cases of serious transgressions, we summon the offender’s relatives, members of his sector’s self-government, people from other committees and try to solve things through dialogue. We want those who are guilty to understand that they were wrong and make amends,” the committee’s co-chair Zeinap Kara explained. Kara said that the main problem in Makhmur was domestic violence, which both the judiciary and the Assayish (the law enforcement) are fighting hard to root out. We were told that in eighteen years, there had only been one murder in Makhmur. The killer was put in isolation for two years, while the families worked through the conflict to avoid a blood feud (still widespread in Kurdish communities). As for where he had been isolated, Kara’s colleague on the judiciary committee Yusuf Sidar ardently insisted that “it was not a prison, it was a place where we can compel someone to listen to us. We talk to them until they understand that they were wrong”. Travelling between the institutions and organisations of Makhmur, we could not help but notice the many small shops clustering in the central part of the camp. Aziz, an energetic member of the shop owners’ committee, said there were 110 of these in Makhmur. Most are family businesses, but a few hire one or two employees. Another form of economic activity found in the camp is the cooperative. The settlement has a small sewing cooperative with nine members and a cooperative cafe with three workers. Both enterprises are run and staffed by women – we were told that these were the first steps towards women’s economic independence. Moreover, there is a cooperative greenhouse in Makhmur, where both men and women – members of the camp’s economic committee – work. The greenhouses were set up with help from the UN and the Qandil charity foundation, but now rely solely on local resources. They grow cucumbers, tomatoes, and peppers, sold at prices 50% below the market rate – just 500 dinars per kilo. The earnings are invested in the running of the project and cover the workers’ basic needs. However, most residents of Makhmur do not have a constant source of income. The norm is for one family member to earn money and support the rest and for another to take part in local self-government. 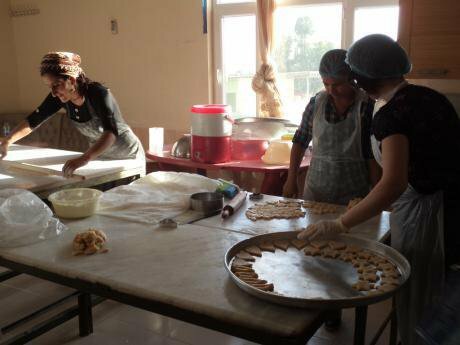 Those who can find a job usually do so outside Makhmur: men work as taxi drivers and construction workers all over Iraqi Kurdistan; women work as cleaners in Erbil’s medical facilities. Among the Russian libertarian left, news of Rojava and its social project, so congenial to anarchist principles, began to spread in autumn 2014. The turning point was the epic defence of Kobanî, when many anti-authoritarians (both in the former USSR and in the west) came to see the Kurdish revolutionary movement in a new light. For many on the Russian left, Rojava embodied anti-authoritarian practices that had only been known through historical or theoretical works. The Kurdish movement gave them a sense of belonging, a feeling that here was a place where they could put their ideals into practice. To be fair, in Russia’s Marxist circles there has long been an interest in the Kurdistan Workers’ Party. Some representatives of that community had made contact with Russian Kurdish organizations close to the PKK years prior. One of the first Russians to visit Rojava was Aleksandr Rybin, a correspondent for the left-wing online publication Rabkor. Aleksandr described his experience of a visit to the Rojava canton of Jazira, its everyday life, and systems of self-government. A little later, news spread of Evgenii Semenov, a volunteer from Russia who went to Rojava and fought for the People’s Protection Units (YPG), the main military force of the Syrian Kurds’ autonomy. Soon, there appeared the first anarchist website in Russian dedicated to news and articles about Kurdistan. A year later, the Kurdistan topic suddenly became the focus of official Russian media. Russia Today aired “Her War. Women vs ISIS”, a documentary about the fighters of Women’s Protection Units (YPJ) of Rojava. This renewed interest was the consequence of, on the one hand, the young autonomy’s strengthening position and, on the other, the intensified conflict between Russia and Turkey. Since then, pro-Putin activists can be found at the Kurdish cultural centre in Moscow, while some critics of Rojava rushed to condemn “the Kurds’ alliance with Putin”. A more measured view of the situation seems closer to the truth. There can be no doubt that the Kurdish movement is involved in some diplomatic interchange with Moscow. However, claims that the Russian government’s line has any influence on PKK’s political position, let alone Rojava‘s internal politics, are baseless. We did not spend as much time in Kurdistan as we would have wished and never made it to coveted Rojava. However, we did see a new society. For us, Makhmur became a “Rojava in miniature”. Of course, we did not have a chance to see its system “from the inside”, thanks to the language barrier, the short amount of time we could spend there, and the fact that, one way or another, our view of local social structures was controlled by our hosts. However, the aims of the dozens of people we spoke with in Makhmur and their achievements to date in getting “regular people” involved in public life deserve close attention from those who are interested in projects for social transformation, alternatives, and potential solutions to the Middle East crisis. The Kurdistan Workers’ Party’s track record shows that significant social transformation driven by leftwing forces is possible even in societies where the political and social culture may at first glance seem inimical to all forms of democracy and equality. That is an important lesson for the left in other countries, including Russia and Eastern Europe. A lack of interest in the principles of political and economic egalitarianism within a society, major inter-ethnic issues, and the concentration of power in the hands of authoritarian state structures are not excuses to throw in the towel. Rather, these are all the more reasons for intense scrutiny and hard work in the service of embedding one’s ideas into public consciousness and everyday practices.